This post is part of Corvus Elrod's monthly cross-blog event, The Blogs of the Round Table. This month's topic is A Game Is Worth a Thousand Words: What would one of your favorite pieces of non-interactive art look like if it had been created as a game first? May’s topic challenges you to imagine that the artist had been a game designer and supersede the source artwork–whether it be a painting, a sculpture, an installation, or any other piece that can be appreciated in a primarily visual way–to imagine a game that might have tried to communicate the same themes, the same message, to its audience. Last year, poking around London's parks and gardens, I stumbled upon a sculpture-fountain hybrid, the beautiful piece of public art pictured right. 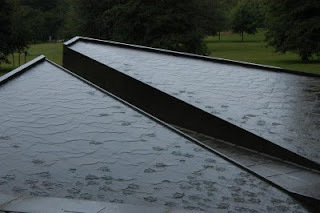 The installation was commissioned by the Canadian Memorial Foundation who held a design contest to select a project. The winner was Pierre Granche, and his task was to design a war memorial for the Canadians who lost their lives in the two world wars. Though admittedly not my favorite work of art, I find it visually appealing and immensely interesting. I chose this piece because the difficulty it poses for the designer. 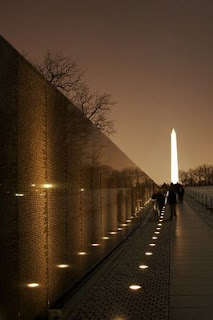 A memorial must visually appeal to an audience and speak a message that respects actual historical events. Now to add a function, to ask this piece to be interactive and entertaining while maintaining the traditionally quiet solemnity of a memorial, is no easy task. Yet I believe videogames can lend themselves well to this goal, serving a similar purpose with tact and intimacy. 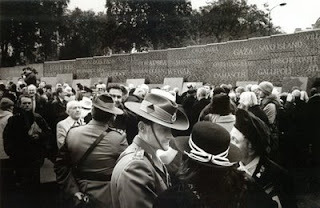 Drawing roughly 3 million visitors every year, the Vietnam Veterans Memorial in Washington, D.C. is perhaps the most well known memorial in the United States. It is a standing monument to the general war experience while maintaining the importance of each individual person whose name is transcribed on the wall. Like the Granche's work, it draws on historical events to speak a greater message. Yet war memorials are strange. What message they do speak is incredibly subjective. Though they may tacitly normalize or even condone state violence, memorials are theoretically politically neutral. One visitor to Green Park may see the fountain as a message about the futility of war, while another may interpret the falling leaves as symbols of national war heroes that prove war is inevitable. Memorials are also fundamentally public experiences. Like a national gravestone, they serve as a site of communal mourning, solemn appreciation, weighty contemplation. Yet while inviting the gaze of any passersby, memorials do not invite criticism. They are not meant to be hung in a gallery to be rated by critics. There is almost an obligation to respect this particular form of art as outside the medium, serving a higher purpose than art for art's sake. My videogame memorial design must be a completely free experience playable in your browser. Players are invited to explore narrative puzzles that track individuals' experiences before and after war. With just enough information to find a solution, visitors to the memorial game are investigators, solving riddles and following clues through a collection of photos, diaries, interviews, and official records to create a portfolio of one person's life during the war. Though the game is opened widely to the public, it loses an important unique to occupied public spaces. A sense of community is strengthened when in physical proximity with others in a shared space. Being bound to other visitors equally in awe at the human experience is appealing, so this game memorial would require multiplayer elements. In addition to a general chat, skilled players could combine portfolios and collaborate with others to track the experience of a battalion. A running list of player names, locations around the world, and their portfolio status, can facilitate a communal experience. A tiered difficulty system, one which includes basic puzzles for children and entertaining educational lessons, could be incorporated to satisfy players of multiple skill levels, improving accessibility. The game should be fun, if that is what you are looking for. I do not believe fun is incompatible with respect, nor did Granche, who "anticipated the public's appropriation of the monument: children can often be seen sliding on the sloping sculptural mass, and it also serves as a fountain: a fine layer of water trickles over the two surfaces of the pyramidal body, reflecting the environment of vegetation, clouds and people." Ideally, the videogame memorial fills the differing desires of those who would visit Green Park, allowing play alongside quiet contemplation. Down time, moments in between play that invite reflection from participants, is incredibly important and could serve as a reward for excellence. Each portfolio completed will shape a unique story, that blends with the stories of others into a larger piece, a game to remember, create, and interpret simultaneously. Interactive can globalize traditionally nationalist experiences and remind us of the very human sensation of loss across borders. Please visit the Blogs of the Round Table's &amp;amp;amp;amp;amp;amp;amp;amp;amp;amp;amp;amp;amp;amp;amp;amp;amp;amp;amp;amp;amp;amp;amp;amp;amp;amp;amp;amp;amp;amp;amp;amp;amp;amp;amp;amp;amp;amp;amp;amp;amp;amp;amp;amp;amp;amp;amp;amp;amp;amp;amp;amp;amp;amp;amp;amp;amp;amp;amp;amp;amp;amp;lt;a title="Blogs of the Round Table" href="http://corvus.zakelro.com/round-table/"&amp;amp;amp;amp;amp;amp;amp;amp;amp;amp;amp;amp;amp;amp;amp;amp;amp;amp;amp;amp;amp;amp;amp;amp;amp;amp;amp;amp;amp;amp;amp;amp;amp;amp;amp;amp;amp;amp;amp;amp;amp;amp;amp;amp;amp;amp;amp;amp;amp;amp;amp;amp;amp;amp;amp;amp;amp;amp;amp;amp;amp;amp;gt;main hall&amp;amp;amp;amp;amp;amp;amp;amp;amp;amp;amp;amp;amp;amp;amp;amp;amp;amp;amp;amp;amp;amp;amp;amp;amp;amp;amp;amp;amp;amp;amp;amp;amp;amp;amp;amp;amp;amp;amp;amp;amp;amp;amp;amp;amp;amp;amp;amp;amp;amp;amp;amp;amp;amp;amp;amp;amp;amp;amp;amp;amp;amp;lt;/a&amp;amp;amp;amp;amp;amp;amp;amp;amp;amp;amp;amp;amp;amp;amp;amp;amp;amp;amp;amp;amp;amp;amp;amp;amp;amp;amp;amp;amp;amp;amp;amp;amp;amp;amp;amp;amp;amp;amp;amp;amp;amp;amp;amp;amp;amp;amp;amp;amp;amp;amp;amp;amp;amp;amp;amp;amp;amp;amp;amp;amp;amp;gt; for links to all entries. I think my video game memorial wall would have the names "Bill" and "Lance" written thousands of times for all the many lives they lost in Contra.